Dill pickle soup is an easy recipe for creamy, low carb homemade soup with potatoes and tangy dill pickles! 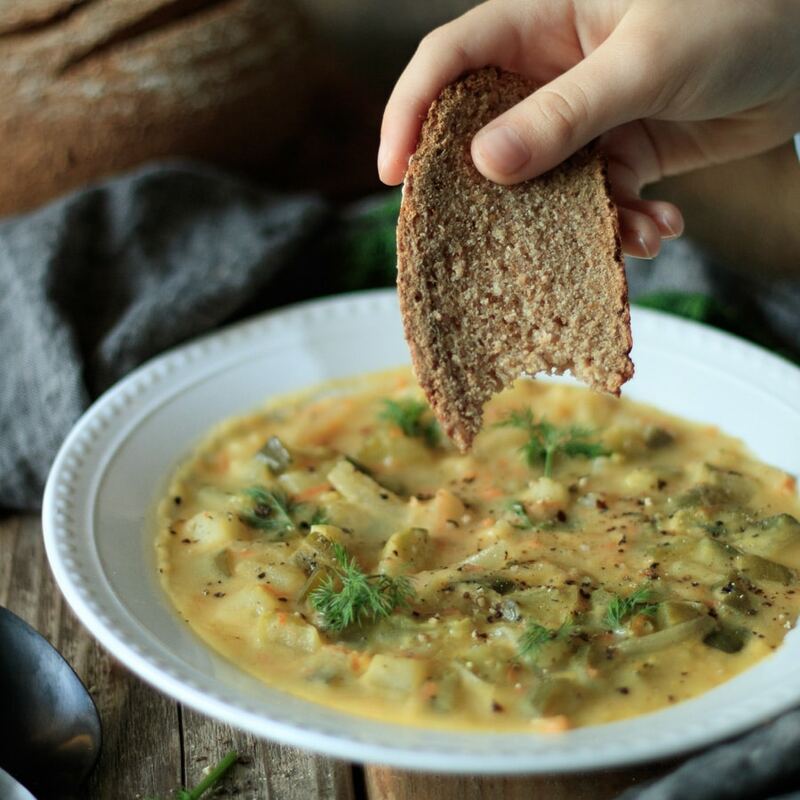 This Polish soup is made on the stove top and is the perfect way to spice up your lunch menu, especially when it's served with homemade rye bread. 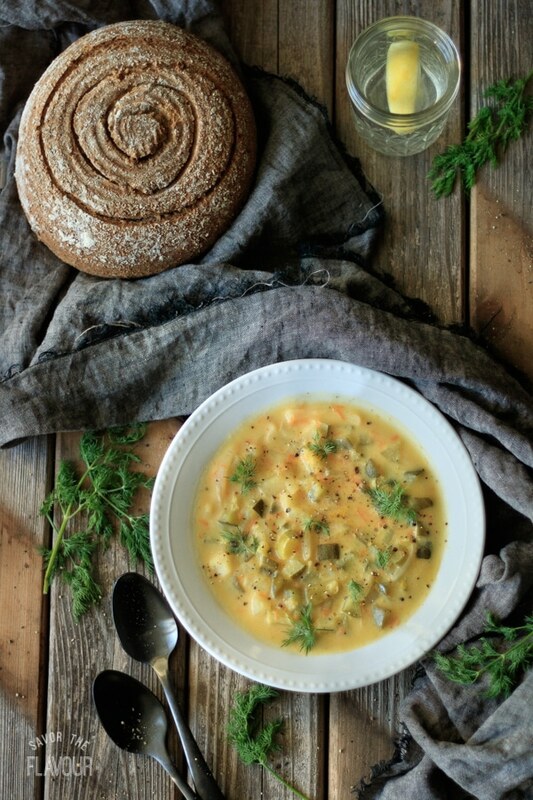 Dill pickle soup is a refreshing change from the typical lunchtime soup. Yes, it has chopped pickles and pickle juice in it. 🥒 Those two ingredients sound out of place in a soup, but trust me, the flavors and textures work. The texture is thick and creamy and yes, it is tangy, but that’s what makes it sensational. Throw in some other vegetables like diced potatoes, grated carrots, and sliced onion. As an added bonus, the onions are caramelized to give it some extra flavor. It’s also a cream-based soup thanks to the sour cream, and is thickened with flour and potatoes. The spices are super simple: just salt and pepper. At the end, add a bit of sugar to balance out the sour taste of the pickles. This soup looks wonderful when it is garnished with fresh dill and a few cracks of black pepper. You could also drizzle sour cream across the top. Traditionally, this Polish soup has no meat in it, but if you feel the need, dice up some smoked ham. In the Old Country, Zupa Ogorkowa, as it is better known, is served with thin slices of homemade caraway rye. Try Busy Baker’s 🍞 version that is slashed with a spiral pattern. 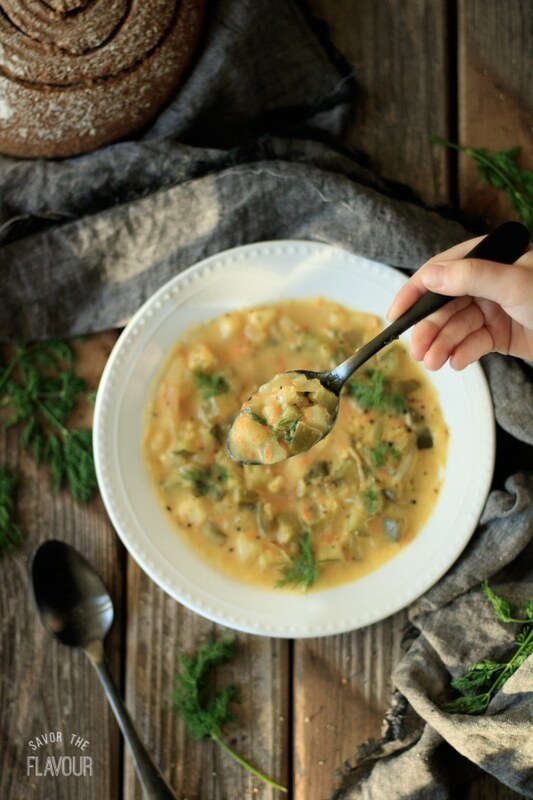 If you love dill pickles and potatoes, you will love this soup. I encourage you to give it a try. It will definitely be a good conversation starter with your co-workers and friends when you tell them you made a big pot of dill pickle soup. 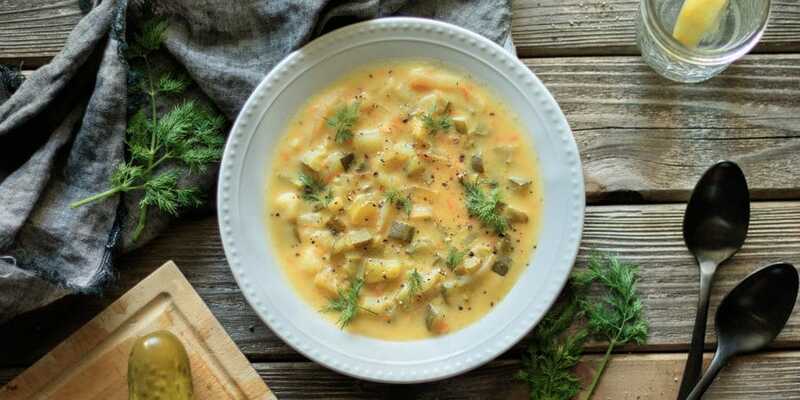 Dill pickle soup is an easy recipe for creamy, low carb homemade soup with potatoes and tangy dill pickles! 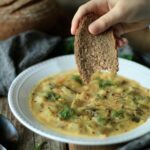 This Polish soup is made on the stove top and is the perfect way to spice up your lunch menu, especially when it’s served with homemade rye bread. Halve and slice a yellow onion, then separate the slices. In a large soup pot, melt the butter until bubbly, then cook the onions over medium low heat, stirring occasionally, until they are caramelized. Deglaze the pan by pouring in 1/4 cup white wine and stirring constantly for two minutes to scrape up the golden-brown fond on the pan. Pour in the chicken stock and pickle juice. Dice 4 cups of pickles. Wash, peel, and dice 5 cups of potatoes. Peel and grate one large carrot to get 1 cup. Add the pickles, carrots, potatoes and optional ham to the broth. Bring to a boil, then simmer until the potatoes are fork tender. In a medium sized bowl, measure out 1 cup of sour cream and slowly add the flour. Stir well to combine. To temper the sour cream, add half a ladle of the hot soup to the sour cream mixture while whisking. Keep doing this until the mixture is well blended and all the same temperature, then add it to the big pot of soup. This technique helps prevent the sour cream from curdling when it’s added to the hot soup. Turn the soup to a simmer and add the salt, pepper, and sugar. Taste it and adjust seasonings as desired. Serve warm with a garnish of fresh dill, black pepper, and a drizzle of sour cream. If you’re watching your sodium intake, use reduced sodium pickles instead of regular pickles. The nutrition facts below uses reduced sodium pickles. If you want to have more protein, add 2 cups of leftover country ham. The nutrition facts below don’t include the ham.